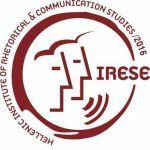 The Hellenic Institute of Rhetorical and Communication Studies was founded in 2016. It is a scientific society which aims at the promotion and extension of research, study, teaching and practice of Rhetoric and Communication as arts and sciences of “thinking, speaking and acting well”. Within this framework, argumentation is considered the main factor of communication and the more essential “tool” of discourse’s critical analysis at all educational levels (formal, non formal and lifelong education) and in various scientific fields (pedagogy, law, literature, philosophy, history, linguistics, psychology, political sciences, physical sciences, health education, journalism, advertisement, communication, administration, dramatic arts, digital education, economy etc.). The Institute, though its activity, aims at giving prominence to oral and written Logos and to the power of arguments as necessary factors in the achievement of various communication goals (e.g. persuasion, negotiation, transmission of scientific knowledge, information, leadership, aesthetics etc.). Also, the Institute aims at highlighting, rhetoric and communication skills as essential and necessary factors of effective teaching and learning at all educational levels in various scientific fields, especially as regards the cultivation of creative, critical and logical reasoning. All the above goals are interwoven with the research and study of all the features of socio-cultural becoming, where rhetoric and communication acts (various forms of communication, strategies, ethical dimension of communication) are manifested by influencing various audiences. In more, the Institute aims at the formation of modern citizens, who through the freedom of thinking and speech and through dialogue, will participate to the decision making and decision taking regarding issues of their era and to the co-formation of the socio-political becoming by respecting “otherness” and by scathing every form of social, political, religious,ideological fanaticism and other forms of exclusion. Through the pre-mentioned action the Institute of Rhetorical and Communication Studies aims, also, at the deeper comprehension of the human nature and of the social development as manifested though the production of oral and written discourse and argumentation. Finally, the Institute aims at the creation of students’ academic, research, professional networks, where the participants will exchange views and experiences regarding rhetoric and communication.